Anneze Brown, left, with fellow PAIRS Instructor. Anneze Brown became a certified PAIRS’ Instructor in 2006 and has been actively teaching relationship skills and marriage education classes to South Florida’s Haitian community since 2009. 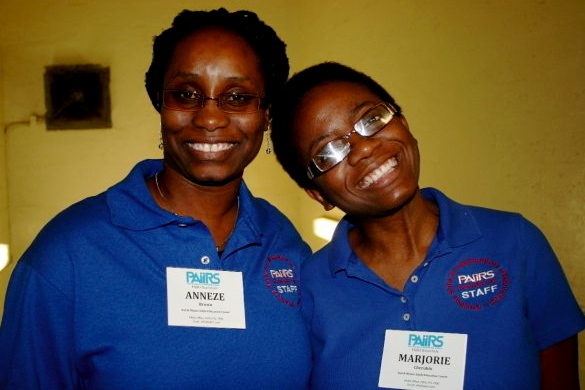 Born in Haiti and immigrating to the United States in 1991, Anneze has been married to Kevin L. Brown for four years. She is the Founder and President of Rapha Family Services (a non-profit social services agency primarily serving the Haitian community in Miami-Dade and Broward counties). She has a Master’s Degree in Social Work, is Co-Founder and President of the Association of Haitian Social Workers, and is currently completing her Doctorate Degree in Theology. She has worked extensively as a family therapist and mental health clinician throughout South Florida. My passion is to see families enjoy their relationships. However, due to the lack of communication skills, many homes are broken and those who are the most vulnerable are the ones who get hurt, most often children. I don’t think that they are much different, except that many young couples may not have the same community support that I have. Having other couples/individuals who share the same commitment to the success of one’s marriage is a blessing. It keeps me married! LOL. I am more sensitive to my family’s feelings and better equipped to deal with their personalities. 4. What are some favorite hobbies you enjoy with your family? Passion to fulfill my destiny on this Earth.